There will be "cosmetic" items available as DLC. There will, of course, be maps added to Titanfall 2 after release, and the good news is they'll all be free, as announced by developer Respawn back in June. 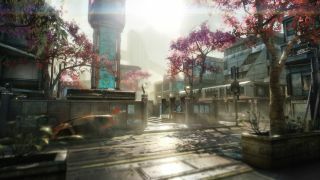 The first of these maps has now been unveiled by the developer, as has a vague date: we'll return to the original game's Angel City sometime in December. You'll be pleased to hear that Angel City is being "fully remastered" for the occasion, but perhaps you'll be less keen that there'll be "cosmetic items" available as paid DLC. The developer is keen to point out that "gameplay is first here at Respawn and they will in no way impact the gameplay. We'll be revealing more details on our post-launch DLC plans, from new maps and modes as well as customization options, in the months ahead". There aren't too many months ahead left until the release of Titanfall 2: in fact, there's less than one. The stompy mech/jetpack-powered shooter will be with us on October 28.